One of the things I’ve done for years is to keep a notebook containing our warranties and owners’ manuals. I simply place them in clear page protectors and put them in a 3-ring binder. That way, whenever I have a question about an appliance, I simply look in the book. One could argue that owners’ manuals are now all online, but I think it’s faster to use my warranty book than to search electronically, especially when I don’t know an item’s model number. 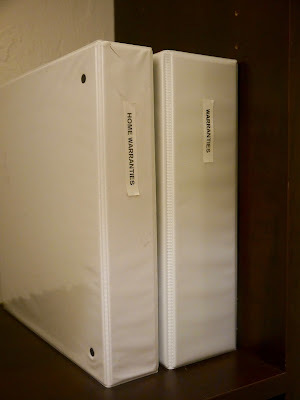 Before we sold our California home, I went through the warranty book and assembled a binder for the buyers, one that had all of the appliances that stayed with the home (range, over, microwave, etc.) Since we’ve moved, I started keeping two books, one for personal items that will move with us and another for goods that stay with the home. 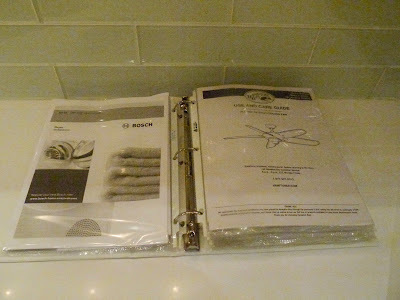 Though putting together a warranty book seems like a lot of effort, it pays off in the long run because I know where the manuals are and can easily access them.